Calibrate your television, test your speed and more with these handy utility apps on your Apple TV. Use Speedtest for a quick, easy, one-tap connection speed test—accurate anywhere thanks to our global network. Go ad free! If you'd like to enjoy Speedtest without ads, we provide the option of removing ads from Speedtest for $0.99. You should only have to purchase ad-free once. If you’re seeing ads and you have purchased the removal of ads in the past, you can tap the ‘Remove Ads’ button which will lead to a ‘Restore’ option that does not require additional purchase. All purchases are tied to your iTunes account. Use this app along with the free and open source MediaPortal DVR with MPExtended installed on another computer to watch recorded and live TV. Swipe to skip forward 30 seconds to skip ads, and back 10 seconds. 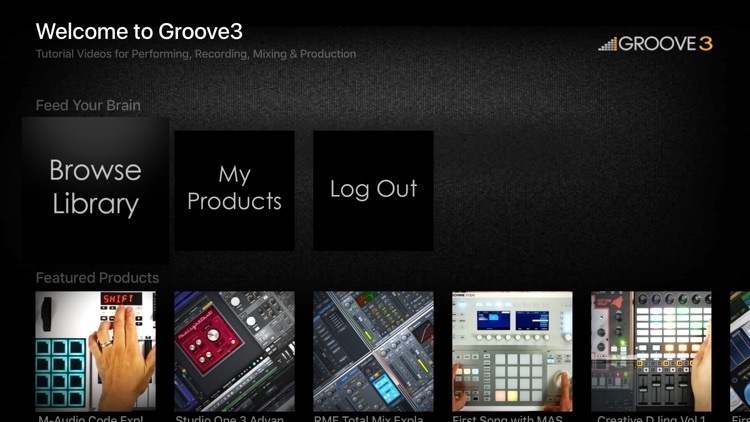 Groove3 is the leading provider of training videos and tutorials for learning Recording, Mixing, Production and music software like Reaper, Sonar, Logic Pro, Pro Tools, Reason, Ableton Live, Native Instruments and much more. Contact us at 800-460-7509. It is time to analyze your local Wi-Fi network! Air Discover is a very fast and professional network scanner utility to detect network devices and services. It helps you to resolve network issues, find unnecessary and possible dangerous network services...or just explore your home or office network environmental. • Detect current network type (Wi-Fi, Cellular, Bluetooth PAN, VPN tunnel). • Show DNS servers, search domain names, local MAC addresses, host name resolve. • Show default gateways, IP addresses, networks. • Show Wi-Fi hotspot SSID (service set identification), MAC address, IP address and vendor informations. • Detect current cellular network operator name, country, region, cellular connection mode (GPRS, EDGE, UMTS, HSPA, LTE). 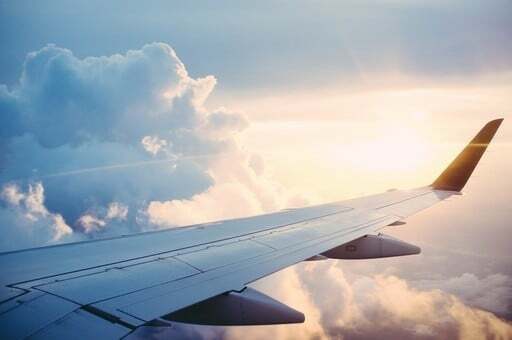 • Show VPN connection (if any) address, DNS hostname, WHOIS record, PING capability, ISP details, address space type (RIR), autonomous system (AS). • Detect current VPN tunnel type. Support Cisco IPSec, PPTP or L2TP. • Depth external address analysis: ISP name, autonomous system name, whois, ping, regional internet registry info. • Full offline MAC vendor database. • Search for available and currently running Bonjour services. • Analyze and describe Bonjour service name, type, protocol, port, IP addresses and other properties. • Show Bonjour host local name, domain name, MAC address (with vendor informations), PING capability. • Search for available and currently running DLNA (UPnP) root and embedded devices and services. • Analyze and describe device name, manufacturer, model, type, version, serial number, UPC code, etc. • Determine operating system/version and UPnP server product and version. • Show DLNA host IP address, port number, UPnP version, local name, domain name, MAC address (with vendor informations), PING capability. • Use the camera icon (upper-right corner) to create and print/send/share a screenshot from the entire page. • Pull down with your finger to refresh the informations. • Long press on a cell to copy/print/send/open as/share the cell value. • Shake your device to refresh the informations. • iPhone 2G, 3G, 3GS, 4, 4s, 5, 5c, 5S, 6, 6 Plus, 6s, 6s Plus, SE, 7, 7 Plus. • iPad 1, 2, 3, 4, Air, Air 2, 5, Pro (9.7", 10.5" and 12.9"). • iPad Mini 1, 2, 3, 4. • iPod Touch 4G, 5G, 6G. • iOS 8, 9, 10. Everything you want to know about your ETHERNET CONNECTION but were afraid to ask. 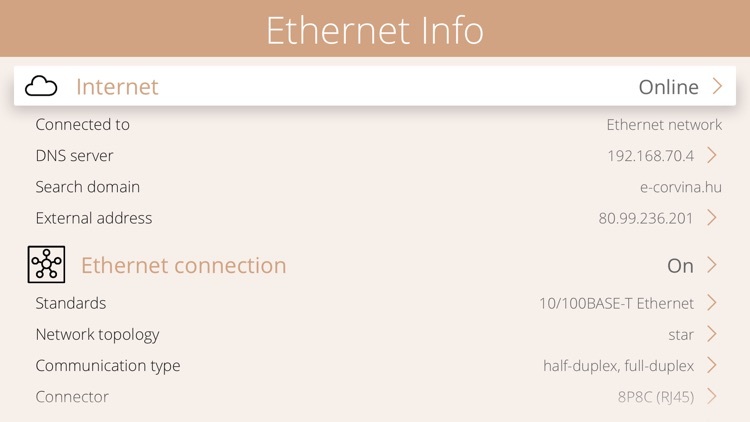 Ethernet Info is a small and useful utility that lets you see detailed information about current Ethernet (LAN) connection from address informations to speed and more. • Detect Ethernet standards supported by your device (10/100/1000-BASE-T). • Describe Ethernet connector (RJ45) and pin-to-pair assignments (TIA-586A/B). • Describe Ethernet cable types (UTP, FTP...), materials and standards (Cat.3-7). • Detect max. physical wire speeds. • Detect max. physical wire distances. • Detect flow control support. • Detect automatic polarity detection and correction support. • Detect HP Auto-MDIX support. • Detect Wake-up features support (Magic Packet, WOL, Link Status Change). • Compare supported Ethernet standards. • Detect built-in Ethernet controller chip type. • Apple TV product name, generation version, model number and release date. • Application Processor type and number of cores. • Firmware (tvOS) version and build number. • Apple TV network hostname. • Apple TV 4 . 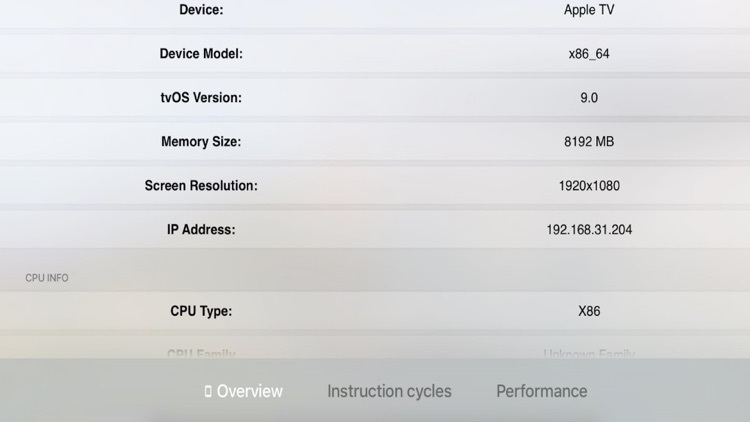 CPU DasherTV is a smart app that shows a lot of information in 64-bit mode for Apple A8 or later processors on Apple TV. It lists the device info, CPU info, almost all the 64-bit ARM instruction set(including general-purpose instructions and SIMD & VFP instructions) and the performance of several common algorithms. It also shows the usage and cycles for each of the instructions listed. Currently, matrix multiplication, sum of array, and color-to-gray image processing algorithm are revealed. See movies and TV shows the way they were meant to be seen. Improve the picture quality of your TV or projector with TV Tune Up, an easy to use calibration tool kit. You stare at your screen for hours at a time, spend 15 minutes with our app to maximize the quality of those hours! Out of the box, your TV is set by the factory to make it stand out amongst all the other TVs in the store, which often means the picture is too bright and not as true to life as it could be. Calibrating your TV’s settings to be ideal for your home environment is key to achieving the best possible viewing experience. 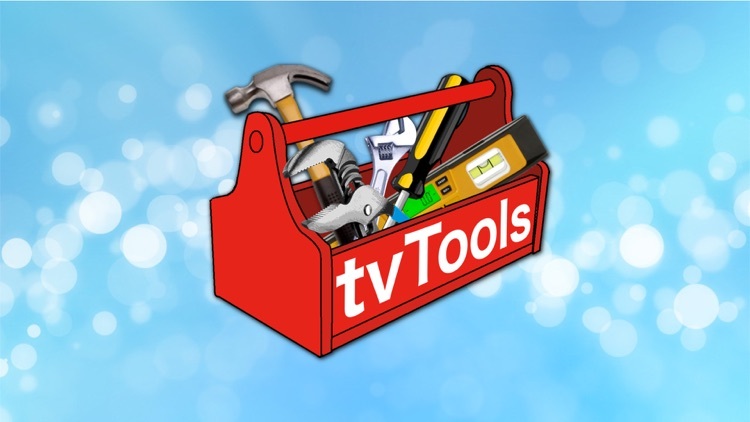 You can use TV Tune Up, with its test patterns, tools, and instructions, to make your TV look its best. TV Tune Up is your best method to calibrate your TV, ensuring you have the correct brightness, contrast and sharpness level settings. As a bonus, TV Tune Up includes system information such as your device's storage usage. Find out who is on your network! 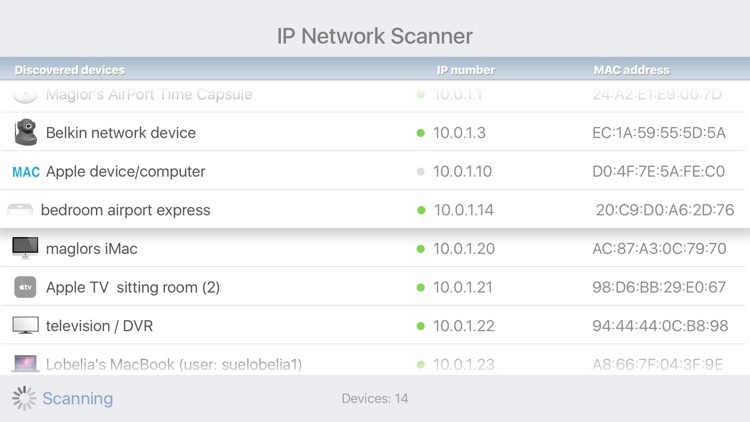 IP Scanner for Apple TV scans your local network to determine the identity of all active machines and internet devices. Powerful results, yet easy, quick and intuitive to use. IP Scanner for Apple TV uses the same, powerful scanning engine as our highly acclaimed application for Mac OS X, but in a lighter-weight package. • Customization: once IP Scanner has detected a device, it will attempt to identify it based on its network 'fingerprint'. You may also assign your own custom names and badges to devices that you recognize, to aid in visually recognizing that same device in a future scan. • Network Tools: Port Scan and Ping tools are built right in! • Currently Active: IP Scanner TV displays the time that has elapsed since device activity was last detected. • Web Server: IP Scanner TV tells you whether a given device is running a web server, to better identify cameras and other web-configurable devices. Don't forget to check out the additional settings for IP Scanner TV in the Apps section of the Apple TV Settings app! 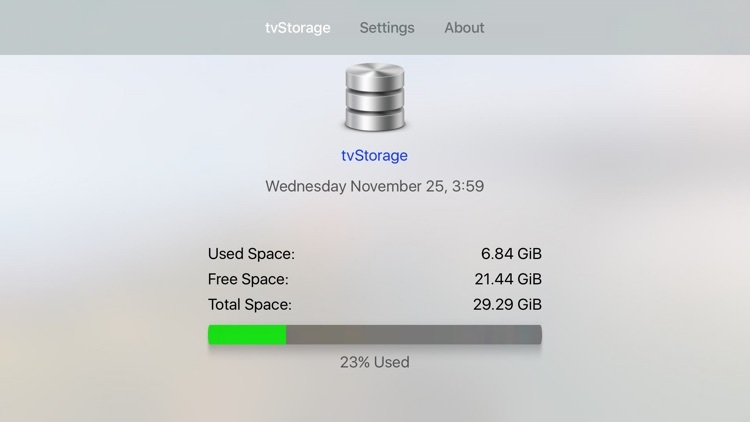 This app allows you to check your used, free and total Storage Space on your new Apple TV. 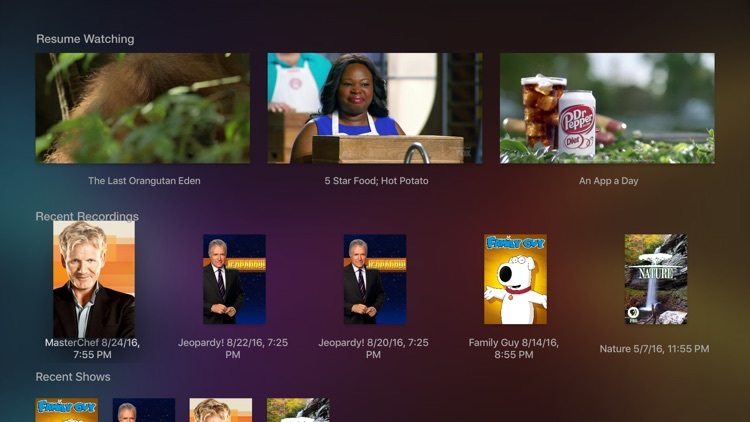 o Show Used, Free and Total storage space on the new Apple TV. o Show space as GB or GiB. o Progress bar shows Used or Free. o Basic weather display based on Postal Code. Everything you want to know about your WI-FI CONNECTION but were afraid to ask. 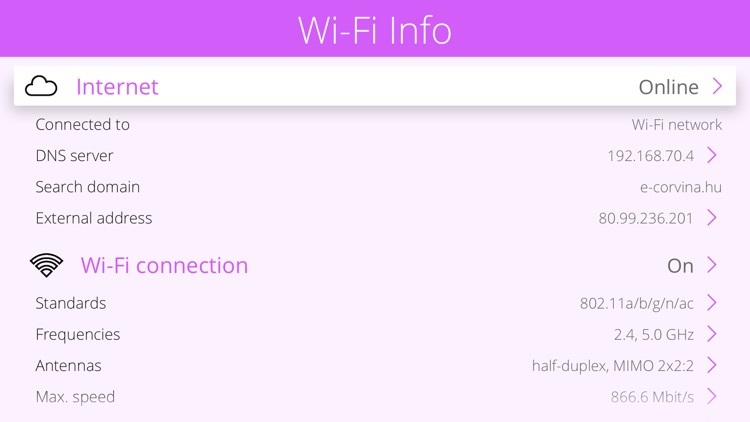 Wi-Fi Info is a small and useful utility that lets you see detailed information about current Wi-Fi connection from hotspot informations to wireless features and more. • Detect hotspot type (wireless access point or ad-hoc connected device). • Hotspot SSID (service set identification), MAC address, IP address and vendor informations. • Detect and explain wireless standards supported by your device (802.11a/b/g/n/ac/ad). • Detect wireless speed-up features (short guard interval, STBC, HT duplicate, etc). • Detect and explain wireless operation frequencies and channels. • Detect and explain available antennas, MIMO config, spatial streams. • Detect and explain Wi-Fi roaming (802.11k/r/v) support. • Detect wireless security options and modes (WPA standards and EAP modes). • Detect wireless optimization (WMM) and access features (Wi-Fi Direct, Miracast, Voice). • Detect max. physical wireless speeds. • Show Wi-Fi network traffic counters: upload, download, errors, quality of service (QoS) categories. • Compare iPhone, iPad, iPod Touch and Apple TV devices. • Compare built-in antennas (MIMO config). • Detect built-in Wi-Fi chip type. • Detect device type and model. • Detect firmware name, version. • Detect last reboot time. 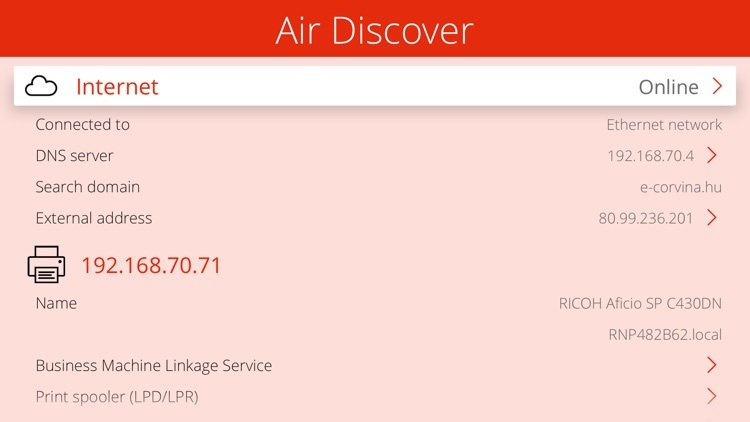 Air Address is a small utility that lets you show all information about your current internet connection. 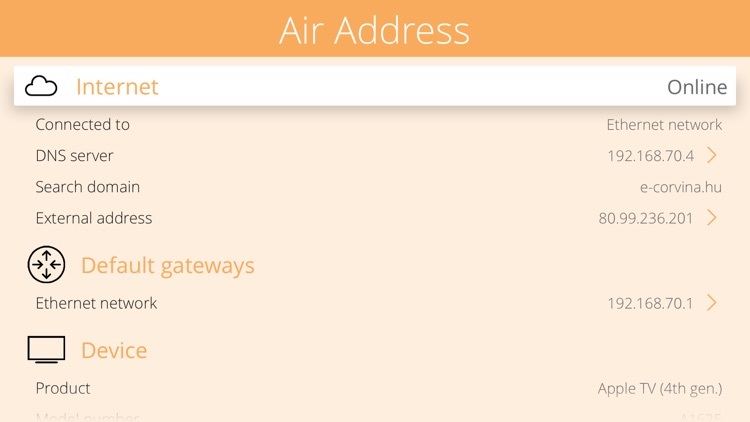 The Air Address app tells your current external public IP address and provides additional network and address information as well. • Check the Internet access state. • Detect the active network interface type (Wi-Fi, Cellular, Bluetooth, VPN) used for Internet access. • Very detailed information about your public external IP address. • Detect DNS hostname, address space type (RIR), internet service provider (ISP), autonomous system (AS) and geo-location. • Detect PING response capability. • List the active DNS servers. Show hostname, network type, MAC address (on Wi-Fi network only), PING capability, WHOIS record. • Show search domains (mDNS/Bonjour related network domain names). • List the default gateway (router) addresses of active network interfaces. • Show hostname, network type, MAC address (on Wi-Fi network only), PING capability, WHOIS record for each default gateway. 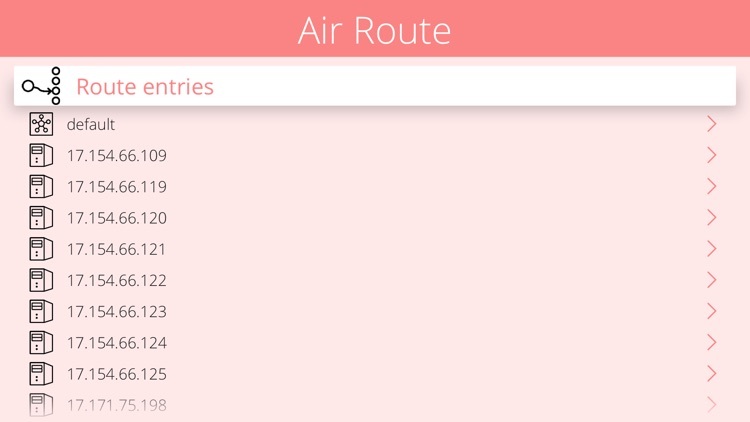 Air Router is a small utility that lets you show all information about your current network routes. Network routing is the mechanism that allows an iOS device to find the network path to another system. A route is a defined pair of addresses which represent the “destination” and a “gateway”. The route indicates that when trying to get to the specified destination, send the packets through the specified gateway. There are three types of destinations: individual hosts, subnets, and “default”. The “default route” is used if no other routes apply. There are also three types of gateways: individual hosts, interfaces, also called links, and Ethernet hardware (MAC) addresses. Known routes are stored in the routing table of iOS device. • List the known network hosts and subnets. • Show hostname, network type, MAC address (on Wi-Fi network only), PING capability, WHOIS record for each host. • Show link local and multicast destinations. • Maximum transfer unit (MTU) value. • Estimated round trip time (RTT). • Local loopback (this device). • Wi-Fi network (client mode). • Cellular (wireless WAN) network. • VPN tunnel (L2TP, PPTP or Cisco IPSec). • Personal hotspot bridge (general mobile internet connection sharing). • Connection sharing via Bluetooth radio. • Connection sharing via USB cable. 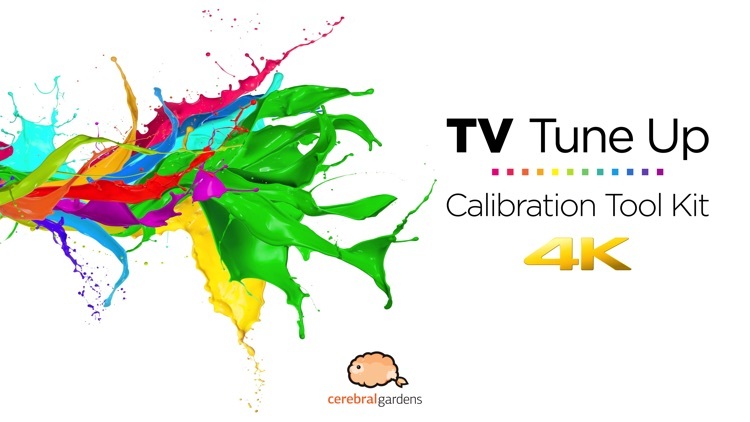 Whether you're a novice or advanced user, you'll find the Professional-grade Test Patterns and guided instructions in Calibr8 simply the easiest way to calibrate your HDTV or projector! 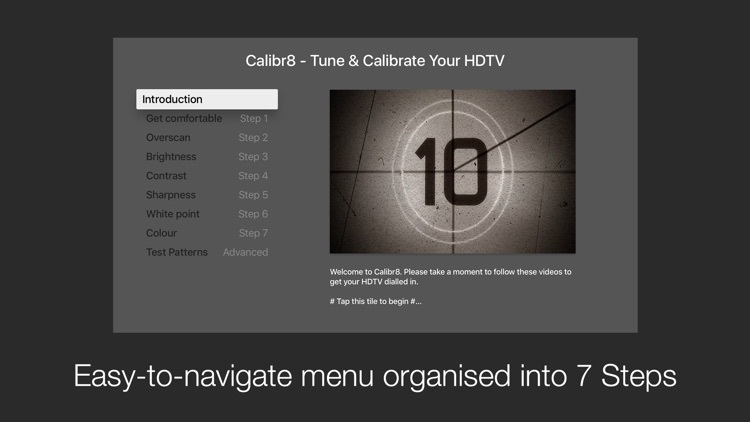 Each Step in Calibr8 plays a video that includes explanations and easy-to-understand instructions (without the techno-mumbo-jumbo), followed by hi-fidelity AVS HD.709 Test Patterns used by industry professionals. These Test Patterns stay on-screen while you adjust the settings on your HDTV. You can Pause / Rewind each Step as many times as you wish, giving you unprecedented control over your Apple TV calibration experience. With Calibr8, adjusting your HDTV settings to suit your viewing style is easy, and you can do it all in a matter of minutes! TV Discover is a small network explorer application. It helps you to discover Internet-capable televisions, displays, media renderers on your local home or office network. • Detect Apple TV (2nd , 3rd [2012/13] and 4th  generations) devices. • Show IP address, Bonjour and DNS hostnames, PING capability. • Show MAC address, MAC vendor, country, postal address. • Show Bonjour service informations: name, type, transport protocol and service related properties. • Detect further Bonjour services on wireless speaker with detailed informations. • iPad 1, 2, 3, 4, Air, Air 2, Pro (9.7" and 12.9"). IP Scanner for Apple TV uses the same, powerful scanning engine as our highly acclaimed Macintosh application, but in a lighter-weight package. This "Lite" edition displays details about only the first 5 devices. 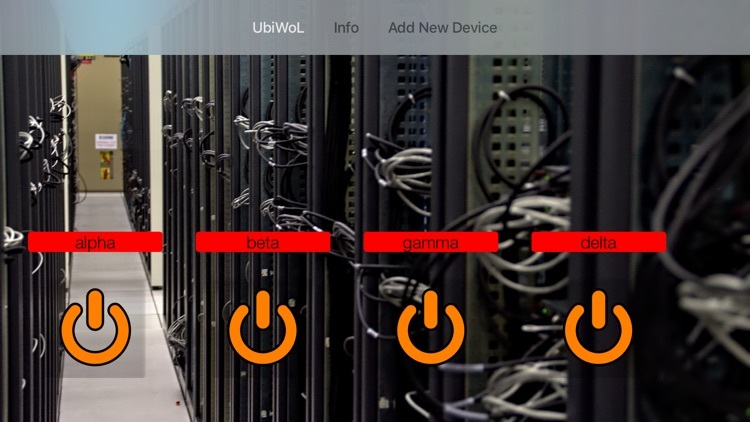 If you have many devices on your home network, you may want to consider the full version of the app, or you may unlock unlimited devices with an in-app purchase from within the Basic edition. 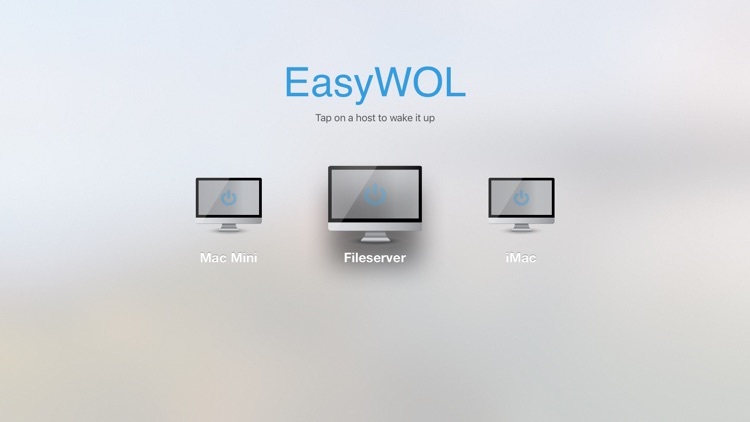 EasyWOL is a tool to wake up your computer in your local network with your iPhone, iPad, Apple Watch or Apple TV. By clicking the "+" button you can add a new host. To wake up a host, you just have to click at the host and confirm the process. 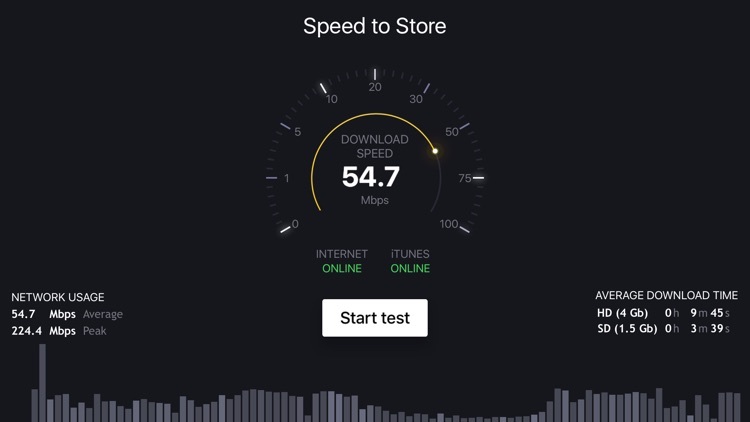 Speed To Store is a professional tool to test the internet and iTunes Store connection speed. 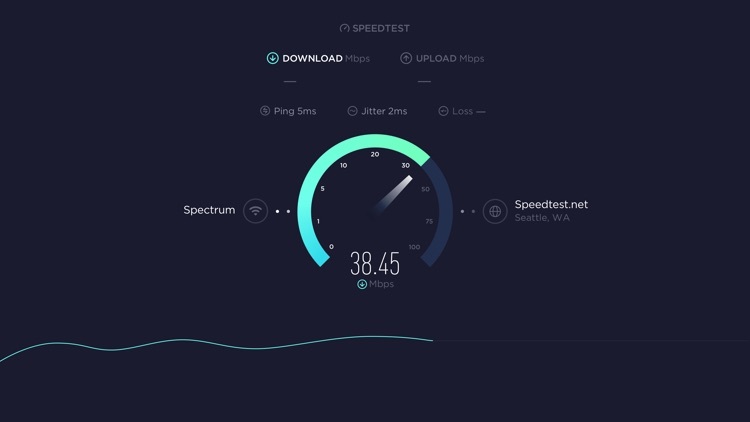 An internet speed test can give you the down-low on your download and upload speeds, detailing whether or not your internet service provider is living up to its end of the broadband contract. What makes the Speed To Store the best choice? • Speed To Store using a massive global infrastructure to minimize the impact of Internet congestion and latency. • With thousands of tests performed every month across hundreds of servers, Speed To Store is the ultimate resource for bandwidth testing and related information. Simply click the start button and Speed To Store will write the connection speed using large blocks of data, and then display the result. 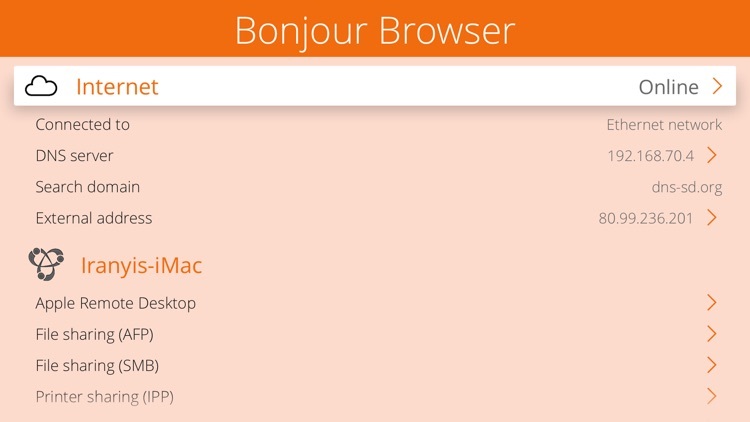 Service Browser is a very powerful tool for discover the available Bonjour (Zeroconf) capable devices on your home or office local network. Bonjour is Apple's implementation of Zero-configuration networking (Zeroconf), a group of technologies that includes service discovery, address assignment, and hostname resolution. Bonjour locates devices such as printers, other computers, and the services that those devices offer on a local network using multicast Domain Name System (mDNS) service records. • File sharing and Time Machine disk detection. • Printer sharing and AirPrint. • AirPlay audio (wireless speakers) and video streaming, screen mirroring (Apple TV). • iTunes Library sharing, pairing and remote controlling. • Home Sharing (iTunes, Apple TV), pairing and remote controlling. • Remote login to OSX computer (SSH, Telnet). • Screen sharing (VNC) and Apple Remote Desktop. • Apple AirPort family base station and status service. • Media streaming and controlling. iOS uses a cache of Multicast DNS records to prevent hosts from requesting information that has already been requested. For example, when one host requests, say, a list of LPR print spoolers, the list of printers comes back via multicast, so all local hosts see it. The next time a host needs a list of print spoolers, it already has the list in its cache and does not need to reissue the query. The Multicast DNS responder is responsible for maintaining the cache; application developers do not need to do anything to maintain it. • Show Bonjour host local name, domain name, MAC address (with vendor information), PING capability. • Pull down with your finger to refresh the information. • Shake your device to refresh the information. Remote Discover is a small network explorer application. It helps you to discover remote controllers, remote controllable devices, remote controller pairings on your local home or office network. 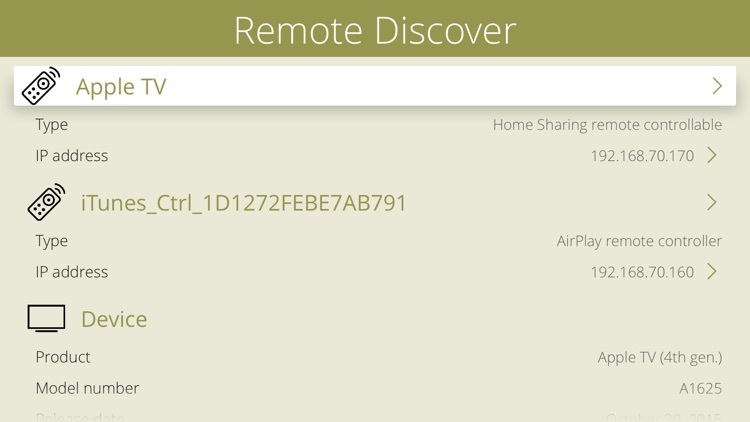 • Detect Home Sharing remote controllable devices (iTunes, Apple TV). • Detect Remote controller pairing. Take back control of data usage on your apple tv. It’s time to stop paying overages. • Simply open app to view Wi-Fi usage and stay within quota. • Ideal usage tell you how much you need to slow down on usage. • Simple and intuitive design reflects current usage status. 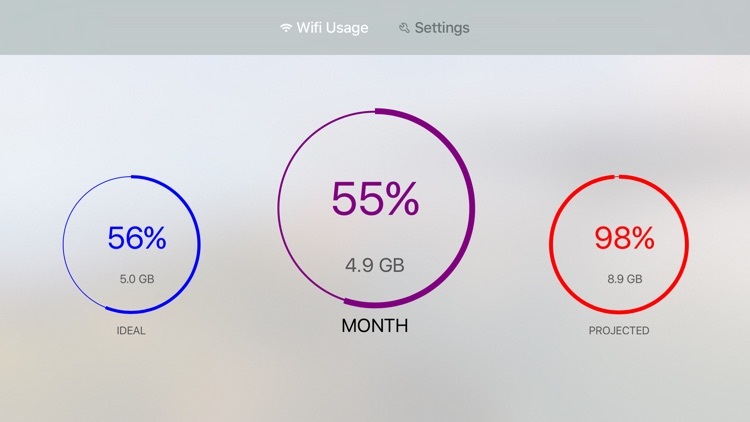 Note: App can only see the Apple TV Wi-Fi data usage when the app is open. from the creators of #1 paid utility in UAE & Malaysia; top 10 paid utilities in Canada, U.K., Spain & Hong Kong for over 5 years.. The TV Controller Data app gives you visibility and insight into the Apple TV remote controller used as a game controller. 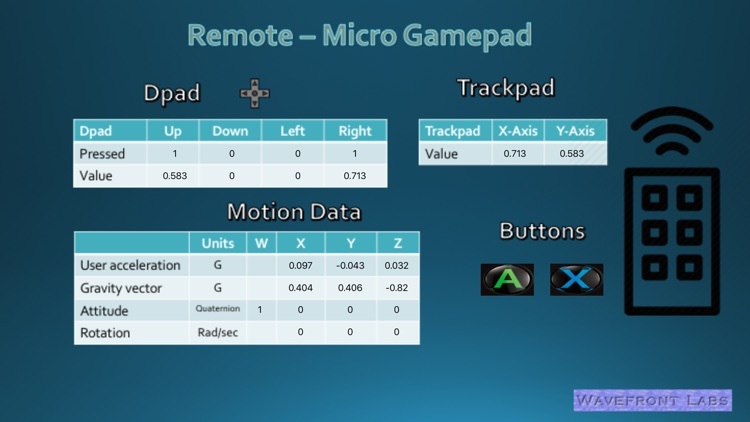 All the touch, sensors, buttons, acceleration, and attitude data are captured from the remote and presented from the perspective of use as a Micro Gamepad controller. If you are a TVOS game developer, then this is an essential app to save you time and give you visibility into the data streaming off the remote. Or, maybe you are just curious about what data is provided by and can be captured from the sensors in the remote control. Either way, this is the essential app to have in your toolbox to give you Remote Controller insight. Unity Remote 5, allows you to use an iOS device to view and test your game live, right inside the Unity Editor without having to build your project. 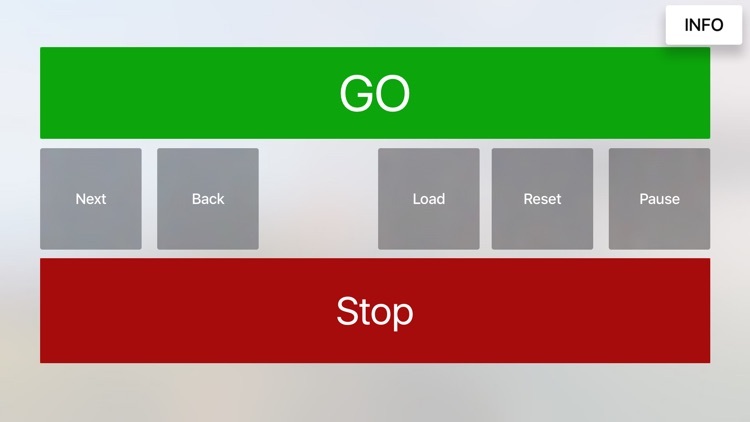 Unity Remote 5 makes your iOS device act as remote control. It streams touch, MFi gamepad, Siri remote (on Apple TV) accelerometer, gyroscope, webcam and screen orientation events back to Unity Editor. This is useful for rapid development when you don't want to compile and deploy your project to iOS device for each change and prefer to use the Unity Editor Game window instead. 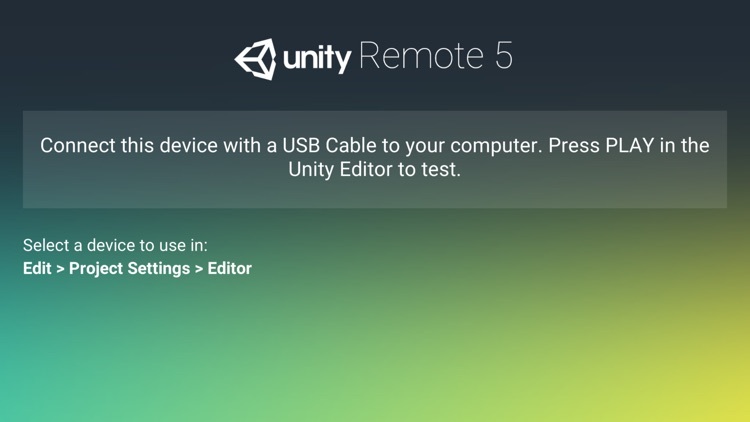 Unity Remote is compatible with any Unity version newer than 5.0, but some features require Unity 5.4 or above. Laggy Wi-Fi? Maybe your neighbor has hacked your password and quietly use it. With WiFi Guard app you will be able to prevent unauthorized access to your network. This application scans your Wi-Fi and detects all connected devices. WiFi Guard can scan your networks automatically and send notifications about new devices. This application is designed for both casual and professional use. It's a great tool for system administrators to monitor and diagnose Wi-Fi networks. Download it now for peace of mind to be confident nobody steals your Wi-Fi. App works great, your able to get notices and see when new devices access the network your on. You can even block the device. Hey, if your kids are suppose to be off line at a certain time and connect after cut off then block their wireless device when your notified they tried to get back on. Thus shows me every device on my network. I have it setup to notify me when a new device grabs an IP address. 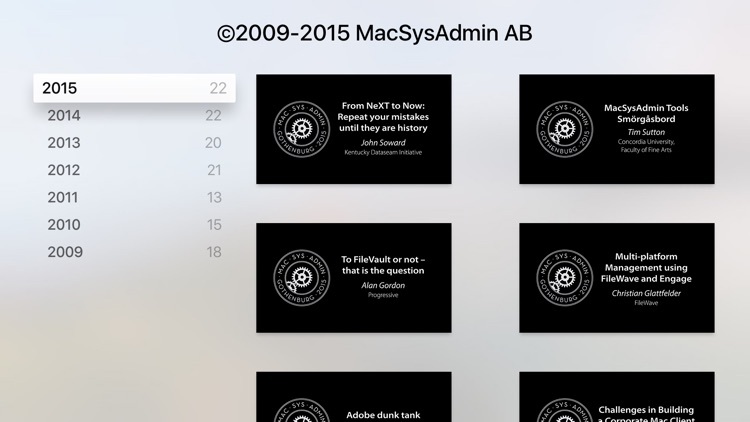 The European Macintosh System Administrators Meeting, MacSysAdmin, has published videos of its sessions since 2009. Here you can watch leading experts in OS X, OS X Server, iOS and related technologies lecture on topics that matters to every Mac SysAdmin. 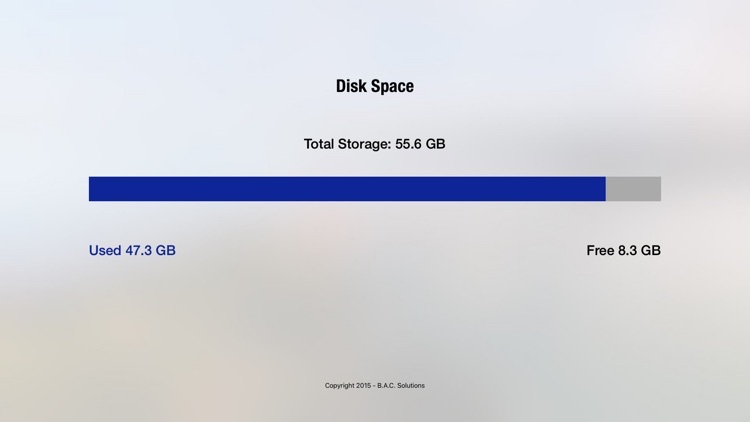 TV Storage Info allows you to keep track of how much storage space you have remaining on your AppleTV. Are you a french expat? You wanna watch french TV from overseas? 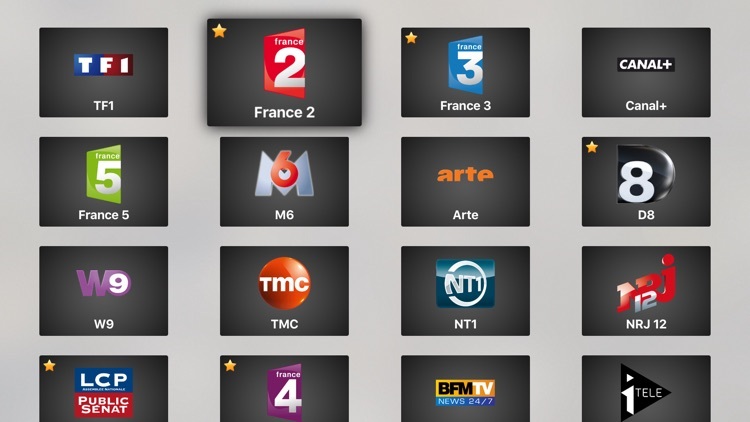 EasyTV - Freebox edition might be the app you are looking for! The app requires usage of a Freebox Server. So you'll need to set up a VPN to a Freebox Server in France (maybe a friend of yours, or family member). Fiber connection is highly advised. This app will allow you to test and troubleshoot your wifi network. It will be very useful when you want to test bandwidth of your wifi, ethernet or mixed network, but your internet connection is too slow (for example 10 Megabits per second), and your router can provide much faster speed between devices in local network. To use this app as a measurement tool you will need two Apple devices : any iPhone, iPad, iPod, Apple TV 4 or Mac. 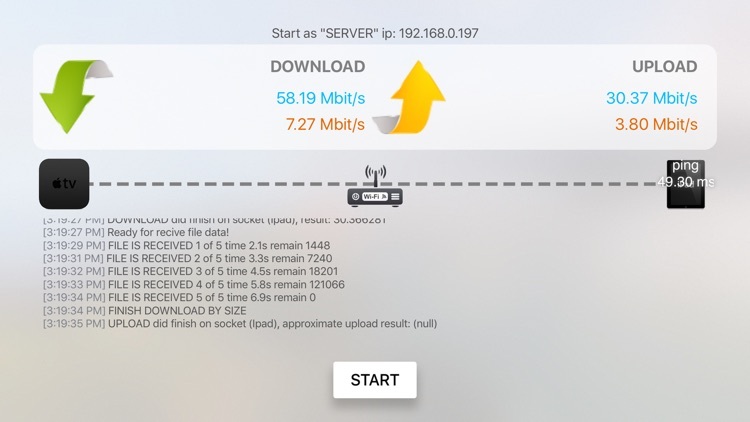 - Test network bandwidth (connect two devices to one wifi network, start the app and test your network bandwidth in one tap). You don't need an internet connection for tests. - Test network bandwidth not only in one network, if there is ip connectivity between them. - Scan your network to detect all devices in it. Also you can write down all known devices and after that you can easily track down all new (possibly rogue) devices in your network. As well you can monitor availability of hosts in your network just by tapping on them. - Ping host in easy way (really handy bookmarks for frequently used addresses). - Review measurement history with colorful and informative charts. - Collects your suggestions about improvements and new features that you think will be handy. If you use 2 wifi devices to measure network bandwidth between them, the result will be less than, if you measure network bandwidth between wifi device and ethernet device(for example MacBook connected to router with wired connection). This will happen because two wifi devices will transfer data to each other and they will share wifi bandwidth. 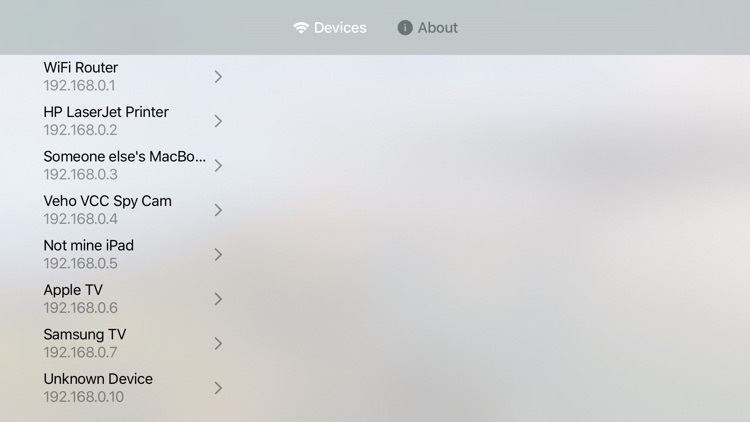 If you want to know maximum wifi network bandwidth for one wifi client, you need to use MacBook as a second device, and you should connect it to your network using wired connection. it also allows you to see what is the ping speed from your apple tv to a reference site. Just another Wake-On-LAN (WOL) Application. For iOS, watchOS (soon) and tvOS! Since I did not like the look-and-feel of the other WOL (Wake-On-LAN) Apps in the AppStore, I had to make my own. I hope you enjoy the this app and rate it on iTunes. myMIDI UDP remote, myMSC sends MIDI over UDP/IP to ipMIDI. For help connecting to the computer please see www.mymidiremotes.com. myMSC UDP remote sends MIDI Show Control Go, Stop, Next, Prev, Load, Reset and Pause Command to a device channel and command type of your choice over UDP/IP to ipMIDI on the IP port of your choice.